OpenXES (pronounced as “open excess”) is a reference implementation of the First XES standard for storing and managing event log data. Application domains of the First XES standard, and the OpenXES library, are manifold. They include, but are not limited to monitoring of process-aware information systems, process mining and general process analysis, and data mining. 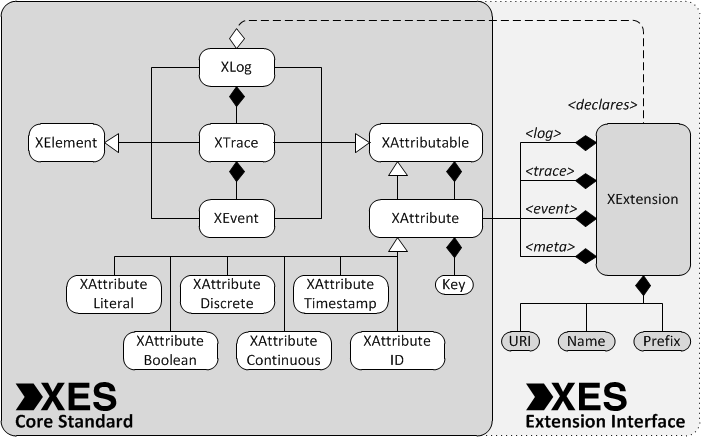 XES is an open standard for storing and managing event log data. The OpenXES library is a reference implementation of that standard in Java™, which strives for strict XES compatibility, ease of development, and the best possible performance. OpenXES is released as open source / free software, under the terms of the GNU Lesser GPL (LGPL) license. Both the First XES standard and OpenXES have been designed with a tightly reduced, generally applicable core definition, with extensibility and generic applicability in mind. The First XES standard provisions a generic extension system, which can be used to store data from arbitrary perspectives, or from specific application domains (e.g., for mapping corporate data models).